Splendid Seniors: Great Lives, Great Deeds now available as ebook! Jack Adler's inspirational collection of biographical sketches, Splendid Seniors: Great Lives, Great Deeds, is now available in PDF and Mobipocket ebook format. The book was first published as an original trade paperback in March 2010. "Imagination grows by exercise, and contrary to common belief, is more powerful in the mature than in the young." So said W. Somerset Maugham, one of the 52 people whose achievements after age 65 are featured in Splendid Seniors: Great Lives, Great Deeds. The inspiring ensemble includes Mary Baker Eddy, who was 86 when she founded the Christian Science Monitor; Alexander Graham Bell, who received a patent for his work on a hydrofoil boat at age 75; Benjamin Disraeli, who became prime minister of England for the second time when he was 70; and Susan B. Anthony, who was past 80 when she founded the International Woman Suffrage Alliance. Splendid Seniors reminds us that creativity, passion & influence can not only flower in later years, but bear delicious fruit. Midwest Book Review's Small Press Bookwatch calls Splendid Seniors "a source of inspiration for seniors everywhere." Pearlsong Press has released the free ebook commemorating the year-long Splendid Seniors Among Us program. The 37-page PDF ebook features the nine people honored in the Splendid Seniors Among Us program, which was launched in March 2007 in conjunction with the publication of the book Splendid Seniors: Great Lives, Great Deeds by Jack Adler. Splendid Seniors: Great Lives, Great Deeds recognizes 52 people throughout history who accomplished great things after age 65. In celebrating publication of this inspirational book, Pearlsong Press decided to honor some of the many Splendid Seniors still among us. We sought nominations nationwide of people whose accomplishments after 65 warrant special recognition and can serve as an inspiration to others. Creativity, productivity, charity, political action, community involvement -- any and all areas of life and personal expression were reason for nomination. Our plans were to honor one Splendid Senior Among Us a month for a year. The seniors so distinguished were announced on the Pearlsong Letter blog, Pearlsong website, and via press releases to their hometown media and mayors' offices. 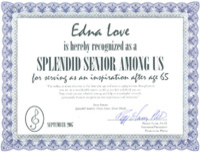 They received a frameable certificate declaring their "Splendid" status and a free autographed copy of Splendid Seniors: Great Lives, Great Deeds. During that period there were three months we didn't receive nominations that fit our criteria for "Splendid" status (which, admittedly, was purely of our own design and preference). Still, we ended up with nine wonderful people recognized as "Splendid Seniors Among Us" and included in the SSAU PDF ebook. The ebook contains information about each of the honorees and the reasons they were chosen, excerpts from Splendid Seniors: Great Lives, Great Deeds, a message from the publisher, and information about Pearlsong Press and our books. Click here to go to the webpage from which you can obtain the ebook. You are welcome to share the ebook with anyone you wish. It's our way of spreading the message that life can be enriching and enjoyable at any age. 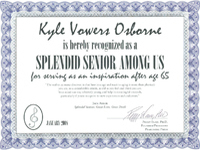 For taking up a new hobby in his 70s, a new career in his 80s, and refusing to "act his age," Kyle Vowers Osborne of Newport News, VA is being honored by Pearlsong Press as the "Splendid Senior Among Us" for January 2008. Osborne, who will be 85 in March, began teaching art at age 80. A few years after taking his first painting class via the Newport News Department of Parks and Recreation at 71, he began exhibiting his oil paintings at The Art Place in his hometown of Chilhowie, VA. The exhibit inspired him to further study drawing, oil painting, and watercolor at the Midtown Community Center in Newport News. Osborne now teaches painting classes to other seniors two days a week at the Center. According to his daughter Lynne Denney of Chilhowie, who nominated him as a "Splendid Senior," Osborne served in the Army Air Corps during World War II, flying as a crew member on 71 combat missions over China and Burma. The young man who had been drafted into the military at 18 learned to drive a car on the Burma Road, ferrying soldiers in a troop carrier. After WWII Osborne returned to Baltimore, MD, where he had been working in an airplane factory before the war, and enrolled in beauty school. He headed back to his hometown with his hairdresser's license, but with no jobs available decided to enlist in the U.S. Air Force in 1947. He married his wife, Jane, in 1950, and served in Okinawa, Morocco, and Germany, as well as less exotic locales, before retiring from the Air Force in 1964. After completing 22 years of active duty in the Air Force, Osborne and his wife opened Kyle's Salon of Beauty in Hampton, VA. The beauty shop was moved to Newport News in 1979. Osborne continues to work as a hairdresser as well as teaching art and continuing to paint. As the "Splendid Senior Among Us" honoree for January 2008, Osborne receives a certificate and an autographed copy of Splendid Seniors: Great Lives, Great Deeds by Jack Adler, an original trade paperback published by Pearlsong Press in March 2007. Splendid Seniors celebrates 52 men and women throughout history who accomplished great things after age 65. Pearlsong Press has sponsored the year-long "Splendid Seniors Among Us" program in conjunction with publication of Adler's book in order to honor seniors who are living inspiration. The program runs through February 2008. To honor nominate someone for the program, see the Pearlsong Press website at www.pearlsong.com. Pearlsong Press, founded in 2003 by psychologist and journalist Peggy Elam, Ph.D., specializes in books and resources that entertain while expanding perspectives on the self and the world. Allie Boniface interviewed Jack Adler, author of Splendid Seniors: Great Lives, Great Deeds, for her blog's Jan. 23, 2008 "Writers Wednesday". Splendid Seniors was published by Pearlsong Press in March 2007 and is available at Amazon.com and other online bookstores, as well as directly from the publisher at www.pearlsong.com. Murfreesboro, TN resident recognized in national "Splendid Seniors Among Us" program celebrating people whose post-65 activities can inspire all ages. Robert Michael doesn’t see retirement as a time for rest and relaxation. Instead, it’s an opportunity to continue his life pursuits. For continuing to work in his academic field and publishing both professional and personal literature after retirement, Pearlsong Press is honoring the Murfreesboro, TN resident as its “Splendid Senior Among Us” for November 2007. Before retiring as a college professor at age 65 in 2001, Michael taught European history, worked as an editor, and was a visiting lecturer at many universities in America and around the world. He has published more than 50 articles and 11 books on the Holocaust (including some published after he retired from the University of Massachusetts Dartmouth, and was the first professor to offer a distance learning(online) course on the Holocaust. Since retirement, Michael has published works ranging from academic books, papers, and articles to historically and personally inspired poetry. The majority of his post-retirement academic publications revolve around the topic of anti-Semitism, as well as European and Jewish history. Although he wrote poetry before retirement, the majority of Michael’s poetic work was published after age 65, in the Menorah Review and in anthologies such as Exploding Ink and Whispers of Inspiration. Taking his own advice, Michael continues to teach in addition to writing. Currently he is teaching World Civilization at Middle Tennessee State University, while also conducting an online course on the History of American Anti-Semitism at Florida Gulf Coast University. Even though he is now settled in Murfreesboro after moving from Massachusetts to Florida, Michael is still sharing his passion for history and life with students and readers across the country and around the world. 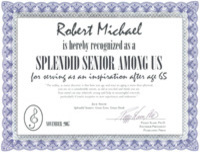 As the “Splendid Senior Among Us” honoree for November 2007, Michael receives a certificate and an autographed copy of Splendid Seniors: Great Lives, Great Deeds by Jack Adler, an original trade paperback published by Pearlsong Press in March 2007. Splendid Seniors celebrates 52 men and women through history who accomplished great things after age 65. Pearlsong Press is sponsoring the year-long “Splendid Seniors Among Us” program in conjunction with publication of Adler’s book in order to honor seniors who are living inspiration. To nominate someone for the “Splendid Seniors Among Us” program, which runs through February 2008, see the Pearlsong Press website at www.pearlsong.com. Pearlsong Press, founded in 2003 by psychologist and journalist Peggy Elam, Ph.D, specializes in books and resources that entertain while expanding perspectives on the self and the world. Virginia art educator Edna Love honored as September 2007 "Splendid Senior Among Us"
83-year-old Pulaski, VA resident honored in national "Splendid Seniors Among Us" program recognizing people whose post-65 activities can inspire others at all ages. Instead of seeing retirement as a time for rest and relaxation, Edna Love sees it as an opportunity to continue her life’s work. For opening up an art gallery and school in her home town and continuing her work with art education after retirement, Pearlsong Press is honoring the 83-year-old Virginia native as its “Splendid Senior Among Us” for September 2007. After a fulfilling career as a wife, mother, and art teacher in Pulaski, Virginia, Mrs. Love retired from the classroom. A few years later she decided to continue educating others about the importance and benefits of art, and in November 1992 opened The Art Place in her hometown of Chilhowie, VA. Since that time Mrs. Love has made the hour-long commute to Chilhowie from Pulaski twice a week to run The Art Place, which is the only business of its kind in the area. "It was a great way for me to continue meeting people and continue my interests in furthering the arts," Mrs. Love says. In addition to featuring a different artist in its gallery every month, The Art Place offers art classes for children and adults in media such as stained glass, pottery, drawing, and painting. "You never outgrow art, and you can always learn," Mrs. Love says. "Art is ageless. You can participate in art at any age, from the time you start scribbling,"
Mrs. Love continues teaching classes at The Art Place as she nears her 84th birthday in October, and occasionally conducts art classes and workshops throughout the country. Mrs. Love has also lent a hand to other institutions in Virginia. When Evelyn Lawrence (the June 2007 "Splendid Seniors Among Us" honoree) was opening her the Mount Pleasant Heritage Museum in Marion, Virginia in 2006, Mrs. Love offered her time and experience, and helped Mrs. Lawrence arrange and display the museum's exhibits. "It is truly amazing what Edna has done for this region," Mrs. Lawrence says. As the "Splendid Senior Among Us" honoree for September 2007, Mrs. Love receives a certificate and an autographed copy of Splendid Seniors: Great Lives, Great Deeds by Jack Adler, an original trade paperback published by Pearlsong Press in March 2007. Splendid Seniors celebrates 52 men and women through history who accomplished great things after age 65. Pearlsong Press is sponsoring the year-long "Splendid Seniors Among Us" program in conjunction with publication of Adler's book in order to honor seniors who are living inspirations. To nominate someone for the "Splendid Seniors Among Us" program, which runs through February 2008, see the Pearlsong Press website at www.pearlsong.com/splendidseniorsamongus.htm. Pearlsong Press, founded in 2003 by psychologist and journalist Peggy Elam, Ph.D.m specializes in books and resources that entertain while expanding perspectives on the self and the world. NASHVILLE, TN— Pearlsong Press is seeking nominations for our year-long “Splendid Seniors Among Us” program. The award is given monthly to living seniors who have accomplished an inspirational goal or action after the age of 65. The goal can be related to creative work, charity work, community involvement, political action, or any inspirational accomplishment. Midwest Book Review calls Splendid Seniors: Great Lives, Great Deeds by Jack Adler (Pearlsong Press, March 2007) a source of inspiration for seniors everywhere." Splendid Seniors: Great Lives, Great Deeds is an anthology featuring brief biographical profiles of fifty-two people who made great and lasting achievements after age fifty-five [Typo in the original review: The book's age cutoff is actually sixty-five]. From Mother Theresa to Alexander Graham Bell, Albert Einstein, Charles de Gaulle, Pablo Picasso, Grandma Moses and many more, Splendid Seniors offers true tales of inspirational deeds as well as memorable quotes from each individual profiled. A source of inspiration for seniors everywhere, and proof that greatness, creativity, passion, and intelligence can bloom their brightest with age and experience. 89-year-old Nashville, TN resident recognized in national "Splendid Seniors Among Us" program celebrating people whose post-65 activities can aspire all ages. Sylvia Hyman is a rarity: an artist whose most important works have all been created after age 80. For her ability to inspire those who would like to surpass or defy age-related limitations, Pearlsong Press has chosen the Nashville ceramic artist as our "Splendid Senior Among Us" for August 2007--just weeks before she turns 90. Hyman's art career spans 60 years. She began working with clay in the late 1950s, but it wasn't until the 1990s that she began producing the trompe d'oeil sculptures -- realistic, eye-deceiving arrangements of letters, scrolls, books, maps, magazines, and other objects all made entirely of clay -- that have won her worldwide fame. An exhibit of 24 of her sculptures is on display at the Frist Center for the Visual Arts in downtown Nashville until Oct. 7, 2007. Other works are in the collections of the Smithsonian American Art Museum, the Museum of Decorative Arts in Prague, the Tennessee State Museum, and several other institutions. Curt Hahn's half-hour documentary Sylvia Hyman: Eternal Wonder recently aired on Nashville Public Television and will be shown in film festivals in France and China, according to Hyman. "I don't really think about the fact that I am the age I am," Hyman told Pearlsong Press founder Peggy Elam, Ph.D. when informed of her recognition as a "Splendid Senior." "I just continue to do the best I can with the abilities I have. "Do what you love and do it to the best of your ability," she added when asked if she had any words of wisdom to share with others aspiring to keep active and creative in their later years. 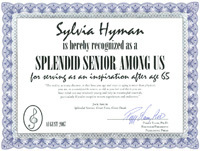 As the "Splendid Seniors Among Us" honoree for August 2007, Hyman receives a certificate and an autographed copy of Splendid Seniors: Great Lives, Great Deeds by Jack Adler, an original trade paperback published by Pearlsong Press in March 2007. Splendid Seniors celebrates 52 men and women throughout history who accomplished great things after age 65. Pearlsong Press is sponsoring the year-long "Splendid Seniors Among Us" program in conjunction with publication of Adler's book in order to honor seniors who are living inspiration. To nominate someone for the "Splendid Seniors Among Us" program, which runs through February 2008, see the Pearlsong Press website at www.pearlsong.com. The book Splendid Seniors: Great Lives, Great Deeds can be purchased from Amazon.com and other online booksellers as well as directly from Pearlsong Press (www.pearlsong.com/splendidseniors.htm). Pearlsong Press specializes in books and resources that entertain while expanding perspectives on the self and the world.